Pinnacle Country Club is one of the most beautiful gated neighborhoods in all of Northwest Arkansas. Current homes for sale in Pinnacle range from $350,000 to over 2.5 Million. 19 Oxford 5334 ht.sq.ft. with 4 bedrooms, 4 and a half baths on half an acre, stunning master bedroom & bath - great curb appeal. 12 Shetland 4106 ht.sq.ft. with 4 bedrooms, 3 and a half baths, awesome backyard with deck (.68/acre) Large open kitchen/Living Area... This home was made for entertaining! Just gorgeous YOU HAVE TO SEE IT! Average List Price - 164/ht.sq.ft. 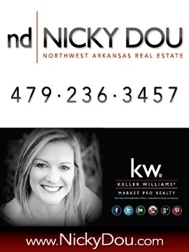 BIG News for Real Estate Companies in Northwest Arkansas!